From right to left: Michelle Florea, Linda Goldfarb, Barbara Russo and Leslie Cohen. Image courtesy of Leslie Cohen. Gwen Shockey: What was the first space you were ever in that was predominantly occupied by lesbians or queer women (it could be a bar or another type of space) and what did it feel like to be there? Barbara Russo: You know in thinking about the questions that you asked Michelle and Leslie in their interviews, it’s been such an incredible walk down memory lane for me. In response to this question: my first bar was the Duchess which is now a Starbucks on Christopher Street by the Christopher Street train station. It was 1973 I think. Actually, it was a little earlier than that, probably late 1972 or around that time. I was living in New York and I was driving a taxi cab. I was one of the first women to get a hack license. There weren’t many of us. You could count us on one hand. The great thing about driving the cab was that I could go anywhere I wanted and there was always parking because the city had taxi stands and one happened to be right by the Duchess. Once when I went to pick up the car in the afternoon (because I drove nights which was also very unusual for a woman) I met this young man who was also driving. We got to talking, and I’ll never forget him, his name was Artie. We had gone to Queens College together but didn’t know each other while we were in school and here we are waiting to pick up our taxis’ for our shift. He was clearly gay. One day I said to him, “You know I’m really interested in women and I have no clue where to go or how to go about meeting them.” He said, “I’ll get back to you!” (Laughing) The next day he comes back, he says, “It’s called the Duchess!” So, I drove down there and I parked the car and I had on one of those little hats that drivers wear and a little leather jacket. I kind of wanted to disguise the fact that I was female when I was driving but I was also a little butch! Not in a big way but I identified in that way. I walked into the Duchess and I asked for a job! (Laughing) I knew a little bit about liquor and I guess I was cute enough so they hired me. I started waitressing there! I always colored outside the lines and after college I started doing anything I could to support myself and when I decided that I wanted to do this I just dove right in. So, that was the beginning. What happened was that as I was exploring my gayness, if you will, I wasn’t really loving what I was seeing. At the Duchess at that time the clientele was kind of older women picking up younger women and I was one of the younger women and that just wasn’t really my thing. I didn’t really know other places to go or what was going on and I was saying to myself, “Man, if this is what it’s like to be a lesbian I don’t know how I can do this!” One night I was out with my friend Artie and we were talking about this and as we were walking down the street he said, “Oh! There’s my friend Richard!” So, Richard comes over and he’s another gay boy and we just started chatting and we all made plans to go to some after-hours club to go dancing (because the gay guys had all of these spaces, right?). There was a wonderful club called The Tenth Floor and another called The Firehouse so there were all of these places that were available where the music was great and the dancing was ferocious and everybody was hot! You know? It was terrific. GS: Were there women there too? BR: There were some women but I wasn’t really looking for that. That wasn’t really what was happening. Before I knew it Richard and I started dating. We didn’t really know we were doing that but we started hanging out and he was coming through something and although my experiences with women were exciting and appealing and intriguing it was a little hard for me to get my head around how I was going to live in a gay world and I didn’t want to be left-handed in a right-handed world. So, I got married! It lasted a nanosecond! He was a sweetheart but it was completely not right for him. I might have been able to do it a little bit more effortlessly than he was but it was wrong, It just was not who I was. To kind of skip through some of the details of that relationship, we move to Florida, he and I, and then everything was falling apart and I came back to New York and he followed and we were living together in Westchester. I’ll never forget this but one afternoon I got on the phone with Leslie [Cohen]! Now, Leslie and I had gone to college together. She was a graduate student and I was an undergraduate student. I’m the youngest of the four of us. When Sahara opened I think I was twenty-four or twenty-five. GS: Wow! You were young! BR: Oh yeah! I was a total baby dyke. I was the youngest of our group and I was the only one who was not Jewish! I’m a Sicilian girl who had twelve years of parochial school. So, I came out of a very different world! Queens College was the first secular school I had ever gone to! GS: Where did you grow up Barbara? BR: I was born on the Lower East Side and lived on Eldridge street until I was about seven and then my parents moved to Brooklyn. I think my dad felt like he was helping the family to live a more suburban life. So, my wonder years were spent in Brooklyn. My dad died when I was quite young and my mom was a widow at fifty-two and was a single mom raising me. After college there was no way I was staying in Brooklyn. I couldn’t wait to get back to the city. GS: When you were in college how did you experience your sexuality? BR: That’s a great question! Interestingly enough I knew I was different from the time I was about nine years old. When I was in college I was a theater major and I was in a play and one of the gals in the play came on to me. I was about nineteen years old or so (I don’t even know if I was twenty) and I was freaked out. It was just like, “You’re crazy, get out of here.” It pushed all my buttons. BR: Both really! Both! There was a part of me that was turned on to it and there was another part of me that was scared to death that I was turned on to it. I’m a Sicilian Catholic girl! This was completely wrong! It was against God and my religion and my bigger fear, my mother would kill me! So, that was what was going on in college and I met Leslie in college and had no idea that she was already kind of exploring this and going there. I thought I was the only gay person in the world. When I moved back to New York from Florida (still with Richard) and I was talking with Leslie, she came out to me on the phone! She told me she was living with this woman named Michelle [Florea] and I went ballistic! I said to her, “Are you kidding me? If you had told me you could have saved me so much grief!” I told her I didn’t know there were any other gay people and I went on and on! I said, “Do you know what I did? I got married! I moved to Florida!” So, she said, “Oh shut up and just meet me at the Lib.” (Laughing) So, off I went! The minute I walked into the Lib I thought I had died and gone to heaven. Everyone was a contemporary. They were young, beautiful women – some way more beautiful than others – I mean really! It was just extraordinary! There was no looking back. I never looked back. That was it. Whatever it was going to take it was going to take and I’m doing it! GS: Did you ever come out to your mother? BR: Oh yes! That’s a great story too! I lived on my own for a while and then I met Linda [Goldfarb] through Leslie and Michelle. Linda was Michelle’s best friend from East Meadow. I don’t remember if it was Leslie or Michelle who called me up. I was working for an advertising agency at the time – it was like a scene out of Mad Men – except I don’t know how I got the job because I couldn’t type and I had no skills for the job but nevertheless there I was. I get this phone call and I guess it was Michelle because I remember her saying, “I want you to meet my friend Linda so come to the Lib tonight.” I said, “Ok!” Then I went to typing on carbon paper and having holes in everything because I was all excited thinking about this whole meeting Linda thing. So, I get to the Lib and I meet Linda and I thought she was beautiful and I said to her, “Do you want to dance?” We went onto the dance floor and it went on from there. I eventually moved in with her and the four of us started paling around together! We would go out all the time together like the four musketeers, you know. Or maybe the three musketeers and I was d’Artagnan because I’m Italian. (Laughing) We were all kind of tenacious and ballsy and smart and courageous – we were all of that! And we had some pop and sizzle in terms of style and look and interests and things like that. GS: From the pictures I’ve seen you all had lots of style! BR: Right! And we’re looking around going, “Is this the best we can do?” So, that was kind of the spark of the idea as we were going around and looking at all of these places. Michelle was the little engine that could. I mean, she was just a little dynamo once the wheels got in motion. Leslie clearly had the art world and the political piece more in her sights and more in her experience but Michelle really was the little engine that could. Forgive this analogy, I mean it in as humble a way as I can express it, but the energy that the four of us brought to this required the energy of the four of us. It was like the Beatles. It wouldn’t have happened without each one of us having been a part of it. I really do believe that. Each one of us brought something to the table that was integral! As I said, Leslie had the arts and politics piece, Michelle was the producer – the little engine that could. That was always my image of Michelle and I mean that with great love. Linda had a lot of business savvy and she was able to put together that piece of the structure which was really important because what did any of us know? We had never done anything like that before. She came from a business background having worked in her father’s insurance agency. I was always about (and I still am): “How are we going to make this happen?” “What are the sticks and bricks that have to fall into place here?” “How do we operationalize this?” “How do we execute?” I realize now that’s what my head is like: how do we execute and how do we make this happen? And not one of us knew how to make a drink! (Laughing) So, everybody is like quitting their jobs and doing whatever to push this boulder up the hill and I said, “I think I should go to bartending school.” I think we should learn about the liquor, you know? (Laughing) Like making a profit, maybe, selling it, how to make a drink, you know. Just some basic stuff. So I did that. GS: Were you mixing drinks at the Duchess when you worked there? BR: No, I was waitressing. My father was a bartender. My father used to own a bar in Coney Island, across the street from Nathan’s, called the Melody Bar, so I was not unfamiliar with rye and ginger and scotch and soda and things like that but I didn’t bartend. So, I go to bartending school and I graduate and I thought I needed to get a job to see how you work behind a bar because we had to hire people and had to know what they were supposed to be doing. So, I did what I did with the Duchess! I went down to La Femme, a lesbian bar on West 4th Street. There was a bar in the front and a little dance room in the back and I was working the bar. I worked with a young Asian American gal, her name was Vicky she was like the head bartender. She was great. She taught me all the ropes. Unfortunately, Vicky died in a very tragic car accident when she was really young. It was just awful. I worked there for several months and I learned what the drinks were that everybody wanted, how much to price them at – I was spying if you will and also meeting people so when we were getting ready to open the club we would knew who to invite and where to go to invite people. There was no social media so we had to create our own. GS: It sounds like a lot was happening really fast. Do you remember what the timeline looked like from concept to opening? BR: I have no recollection. This part of the story was probably just a couple of months if that. Everything was moving very fast. Going back to the operations piece, I was putting together all of the people that helped us put Sahara together. My cousin Peter designed the logo. Leslie and Peter were actually in high school together. They were in the same art class. There are no coincidences in life when I talk about all of this energy coming together. A fellow who I went to college with named Warren went into his father’s painting business and painted the whole club for us. My cousin’s husband was a carpenter and he built it for us. It was just all of this energy coming together around this one particular moment. It was really extraordinary! The other piece that is really significant in a way (outside of the lesbian culture piece) was that this happened in 1974-75 so if you think back historically to what was going on at that time Carter is president, we are in a recession, inflation is at twenty percent and four little lesbians are opening up the first women-owned and operated lesbian discotheque in New York City. Talk about being disruptors, right? GS: I asked both Leslie and Michelle what it felt like not only to be in that time doing this thing as women and as lesbians but maneuvering through all of the hurdles placed in your way financially and legally. BR: Oh, every time they said no, we said watch us. Every time. Part of it is that you get to a point and it’s like a snowball rolling down a hill. You start to pick up steam around it and you’re just not going to stop. I do career consulting now. BR: Right! (Laughing) When I’m speaking to different groups I often talk about this. Not to get all woo-woo but what you think about you bring about! What you focus on and what you put your attention to you can make happen. It’s the, “yes I can and I will piece” and that was the space that I think we were all in. We didn’t know it at the time. We were all just being very proactive and reactive to circumstances and we were just doing it! Nothing was going to stop us! Every time somebody said no we said we’re going to figure out a way! The more we stayed in that zone the more things fell into place. The right person showed up at the right time. Like how did we get that lawyer and the law team that wanted to represent us, you know? New York State had never given a liquor license to four women. GS: Wow! Holy crap! New York had never given a liquor license to women opening a business before? BR: I believe so. Women may have had a liquor license but what was going on then was that a lot of clubs that were open were backed by the mafia and often they would have a woman as a front. I don’t know how the licensing worked in those situations but what I do recall (and I hope my memory is correct) is that part of what intrigued the law firm to represent us was that this had never happened before. The cabaret license also, because we weren’t just selling liquor, we were a dance club. The licensing back then (and I think they’ve since changed some of it) was really archaic and sexist. GS: How did you learn what you needed as far as the licensing was concerned? BR: Through the professionals that we were working with, whether it was the lawyers or the accountants. It was a graduate school experience for me. I refer to it as my first MBA: It was a “Major Business Accomplishment.” Our survival depended on it. We had a lot of skin in the game. The money that it took to open it in hindsight – thirty grand – seems ridiculous today. That was a lot of money then! My mother didn’t have it to give to me! Thank god for Linda and that she was willing to cover my end. I will be forever grateful for that because it gave me the experience and the opportunity. I certainly did my part to earn it, I believe, never-the-less without it I wouldn’t have been a part of it. The creation of Sahara was significant on a lot of different levels. We opened up on 65th Street and Second Avenue which was in the height straights-ville New York City! We were right across the street from a Catholic Girl’s School! (Laughing) It was extraordinary. It really was extraordinary. Right to left: Leslie, Barbara, Linda, unknown, Michelle, unknown. Image courtesy of Leslie Cohen. GS: Hearing you talk about the four of you and your amazing dynamic and how unique each of your contributions were to Sahara, I’m curious what it was like to navigate your relationships with each other day-to-day during the process. I’m sure it was stressful at times! GS: Whoa! So much of this story has so much serendipity in it! It’s amazing. BR: Exactly! Exactly. But I’ve done enough studying in my work now that I know there is no such thing as coincidence. It’s all very intentional. So, we told my cousin Peter and we gave him the name and he came up with this incredible logo for us and off we went! The rest is history so to speak! GS: Do you have any pictures of yourself wearing that shirt do you think? BR: No. I had saved that shirt for a really long time because it did have such meaning for me but it got lost in between various moves and ultimately any nostalgia I had remaining got lost to Hurricane Sandy. I lost a lot of stuff. But that was a very vivid moment in the story of Sahara. GS: I feel so lucky that I get to hear each of your stories about Sahara: yours, Michelle’s and Leslie’s! I would love to hear some of your highlights from the days that the club was open! BR: You know, Leslie and Michelle really spoke to kind of the big picture events that we created there that were so powerful and created so much opportunity for lesbians, you know? I knew you were going to ask me a question around this and I was thinking about that and I thought they really covered the big picture stuff. For me the highlights are seeing that young woman walking into the club for the first time (whoever it was) and wanting to make sure she felt safe and comfortable and welcomed. That was always on my mind. I was always very mindful of looking out for that. GS: Did you often interact with people right when they walked in? BR: Oh yeah. Especially if I saw someone walk in who was really uptight because they could be uptight for a number of reasons, both positive and negative, so I was a little vigilant about that because I wanted to keep the space safe. So, for me it was really about the impact on the individual and making them feel welcomed and comfortable. There were innumerable times that I would walk over to a woman and say, “Welcome!” I’d introduce myself and I’d ask if it was her first time here just to break the ice a little bit. People came to Sahara from such a range of experiences and for a range of reasons and walking through that door for the first time had to be both incredibly wonderful and incredibly scary. I’d watch the wave come over them of like, “Wow. Wow look at this! Look at how pretty it is!” You could see it! Almost like a cartoon with a bubble over a person’s head saying, “Look at all the women here! Everybody is so good looking! It’s so hip and chic!” Whatever they were thinking or whatever the words were for that time. That to me is what makes Sahara so extraordinary. I went to a luncheon one time and I heard the speaker say, “Sometimes you’re afraid to do something and it feels like you are jumping off of a cliff and sometimes you jump off the cliff and you land in paradise.” I think for a time Sahara was that for all of us. For us who created it and for all of those who experienced it. Today, I think Sahara represents a coming of age for all of us: coming into our own being, whatever being means, being confident, being powerful, living in our truth. I’ve met so many people in the most random circumstances who went to Sahara and if I happen to mention that I was connected to it, they just can’t wait to tell their story and it’s always about their first moment walking in and what it meant for them. GS: That’s just the coolest thing for me to hear. It’s why I start these interviews with the question about first queer spaces. It was the same for me – when I first walked into a truly special lesbian bar that had that feeling to it – that feeling of paradise that allowed me to realize that there could be a wonderful life for me as a queer woman, it’s magic! BR: Right! And that feeling that I’m going to do this no matter what it takes! You asked earlier about my mother and we got a little bit off track but to circle back to it: when we were opening Sahara we decided that we needed to do a dress rehearsal! GS: Oh wow. That’s so intense Barbara. BR: So, now that you know that story we’ll come back to the dress rehearsal for Sahara. Everybody is inviting friends and family because we wanted to have people to serve and we wanted to figure out how to get the ice to the bar, how to have the waitresses work the floor, you know just all the logistics! So, I invited my big Italian family and they were all great and said yes! I’m so blessed. I call my mom to tell her and this is like the biggest event in my life at the time, this was huge on like so many different levels for me and she says she’s not coming and I said, “Really? You know what mom, I’m done. I’m done doing this with you. Forget you have a daughter.” And I hung up the phone. An aunt of mine was sick in the hospital at the time and my mother went to visit her and god bless her, my aunt Lauretta, she’s ninety-seven today. She’s still kicking and still has all the seeds on the cracker! She’s sharp as a tack. So, my mother went to see her and they obviously spoke about this and Lauretta looked at her and she said, “Are you out of your mind? What are you doing?” She said, “You’re worried what your neighbors are going to think?” She said, “This is your daughter! When you get sick who’s going to take care of you? Your neighbors?” She straightened her out right away AND mom showed up! AND after that she became a regular! She came to see all of the entertainment on Thursday nights! We would do the cabaret and there were some singers that she really liked (Pat Benatar being one of them) and she’d always call me up and go, “Can I come tonight?” And of course she was La Princessa and got the royal treatment and she loved it! GS: It just goes to show you what a place like Sahara can do for someone who would have never stepped foot in there otherwise! BR: Right and then she walked in and it was beautiful! It wasn’t like a dive or a dump! It was beautiful! Like come on! I’m not going to do something that isn’t beautiful! GS: Yeah! That’s something I have been thinking so much about after talking to all three of you. This aspect of beauty and aesthetics I think was really a turning point in lesbian culture. GS: That’s just so powerful and it changed everything! BR: We were a bulldozer. We changed our corner of the world. We really bulldozed a path. That path now gives young women, and I like to believe some young men as well, the opportunity to travel on it in a more confident and powerful way! GS: In those moments, was Sahara for you everything you had yearned for and dreamed of when you were young and at the dive bars? When Sahara closed which was devastating for all of us it disrupted our relationship and was a mindblower on so many levels. We went our separate ways and for a bit we were a little estranged. Leslie and Michelle went on to do their promoting and their pop-up parties and Linda and I went on to open a gay boys disco called Moonshadow. I was in the business for twelve years from Sahara to the end of Moonshadow, which was originally supposed to open up as another women’s club but again the state liquor authority was giving us a hard time because there was an after-hours joint above us and they thought we were fronts for it. I mean it was just ridiculous. They were holding back on issuing a liquor license to us and we needed to start generating income and revenue and some friends of ours said to us, “Why don’t you open up a juice bar! Let the boys come until you get your liquor license and then you can have the girls come!” That’s what used to happen in reverse in the old days! We needed to make money so we said, “Ok!” We needed to have the registers start going caching! 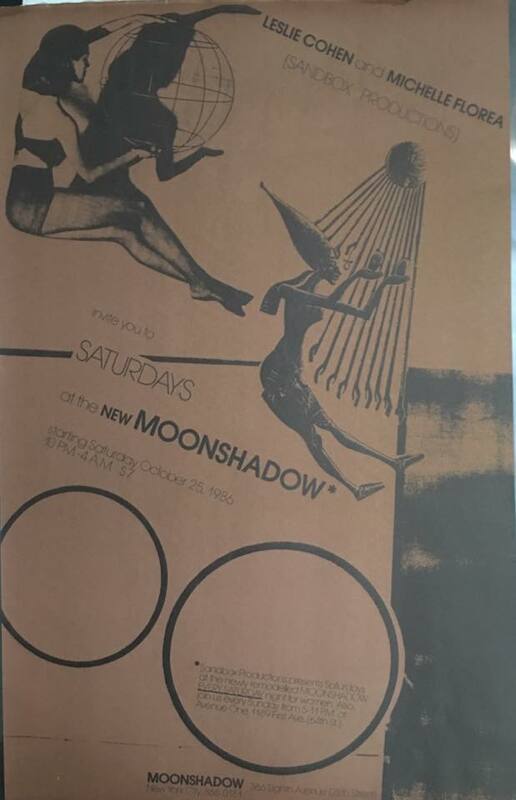 So, we opened up Moonshadow and it was phenomenally successful as a boy’s club to a point where women didn’t want to come and then AIDS hit about two years after we opened and nobody knew what it was or what was happening and it was just a very devastating period. We had a list of about five thousand people who we would mail invitations to and we would get half of it back saying deceased. It was from one month to the next. It was just god-awful. It was horrendous. Through Moonshadow, for a short period of time, Leslie and Michelle and Linda and I got back together and Leslie and Michelle did a few events at Moonshadow before I walked away. It all comes full circle and now we’re all old ladies! I don’t know how that happened! After losing Sahara and closing Moonshadow and living through the AIDS epidemic I transitioned into working around straight people in an office. It was hard! My whole career basically I was working for myself and then suddenly it’s “Disco Diva Seeks Employment!” It was pretty challenging. It wasn’t a real resume grabber. But I landed in the staffing industry built yet another career, found the love of my life, Bobbi (34 years and counting!) and, as I’ve said, the rest is history! I made it work. So, there you go! GS: Quite a story Barbara! BR: Oh it’s everything! It’s totally everything! And that era was a real tipping point! So much was happening! The women’s movement, boundaries were being pushed in so many different areas and sometimes it just felt like it was the perfect storm. Everything came together in a way that was very special and very significant and it worked! I hope someday there are other young women who will be able to create something like Sahara for the twenty-first century moment. BR: I listened to Nancy Pelosi the other day being interviewed by Joy Reid and she said, “No matter what you do think about the why!” Why are you doing it? What’s it going to take? Be strategic. With Sahara we weren’t that conscious of it but we were doing just that! GS: Sometimes I think it just has to happen that way. Totally from a place of passion and necessity. Later when you reflect on it you realize how significant it was and how much it meant to so many people. BR: Exactly. And I so love Leslie and Michelle and Linda. That moment in time that we all shared is indelibly etched in my heart. It is all a part of the recipe that makes me me! GS: I can really see that with all of you. Thank you from the bottom of my heart for sharing your story with me Barbara. From right to left: Leslie, Michelle and Barbara in Florida several years ago. Image courtesy of Barbara Russo. Michelle and Barbara in Florida recently. Image courtesy of Barbara Russo. Barbara and her partner Bobbi in Lake Tahoe. Image courtesy of Barbara Russo.